Shoe shine sponge with real beeswax to keep shoes shiny. Nourishes and softens leather while evening out and reviving colour. Refreshes sole edge and heel colour; guarantees an ideal colour match. 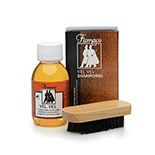 There are a multitude of products for cleaning and maintaining your leather shoes on the market. But they can be confusing and some shoe owners do not make the most of the variety of care products available. The secret is choosing a small range of trustworthy products that work for you and your shoes. While wax cream and dubbin are the foundation of sophisticated shoe care, it makes sense to also use a shoe cleaner from time to time. This will remove any excess shoe cream, dirt, salts and moisture from the leather upper and the inner lining und regulate the leather’s natural pH-value. A shoe cleaner is a great addition to any thoughtful shoe lover’s cleaning kit. Every two or three months you should care for your shoe sole, too. Apply oil directly on to the leather outsole and spread it evenly on the surface with an appropriate brush. This shoe care product promises less friction, protects against humidity and lengthens the lifetime of your footwear. While some other shoe care products are not superfluous, be sure to invest in a quality brush and shoe horn, as well. Another essential shoe care task is the impregnation of the vamp. If done properly, such impregnation will raise the water-resistance of your favourite leather shoes. The concept is very simple. An impregnation care product reduces the leather’s absorption qualities whilst making it more hydrophobic, meaning water should drip off the surface. Please note: An impregnation cannot guarantee a completely water-resistant shoe, because the leather pores cannot be totally closed. If properly cared for though, the impregnation will form a thin film upon the leather, which protects the upper against a small amount of water. 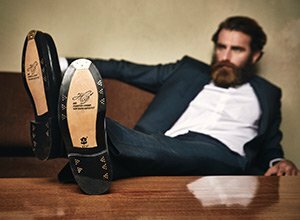 With our high quality shoe care products wet feet will be a thing of the past.